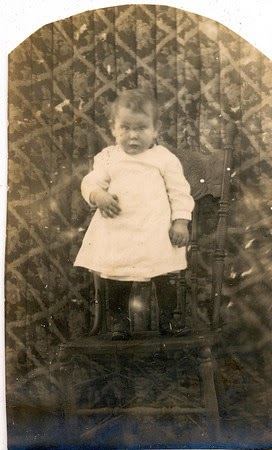 Family History fanatics have photos and I have my share. They run from Sneedville, Tennessee to Wichita Falls, Texas. 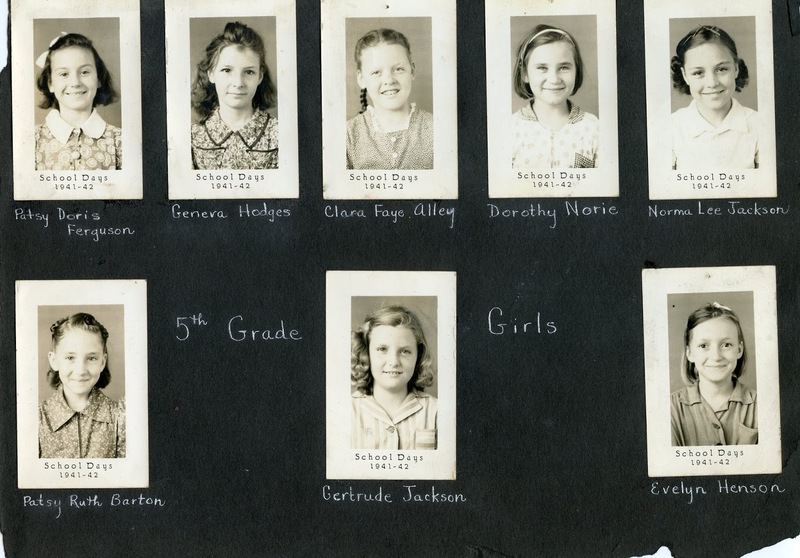 They include Rhea, McCollum, Yeakley, Jones, Findley, Shearer, Pitchford, and Farris. There are some unidentified folks and some that aren't family. All these photos need to be shared. Each one will be identified with the information I have. I hope they will be found by the people who know them. Thanks to Gary Cliser for creating this video for me. My mother, Ruby (Yeakley) Rhea, graduated in 1941, from Texas Woman's University in Denton, Texas. She earned a BS Degree in Library Science. As part of her education, she was required to teach an elementary school class. 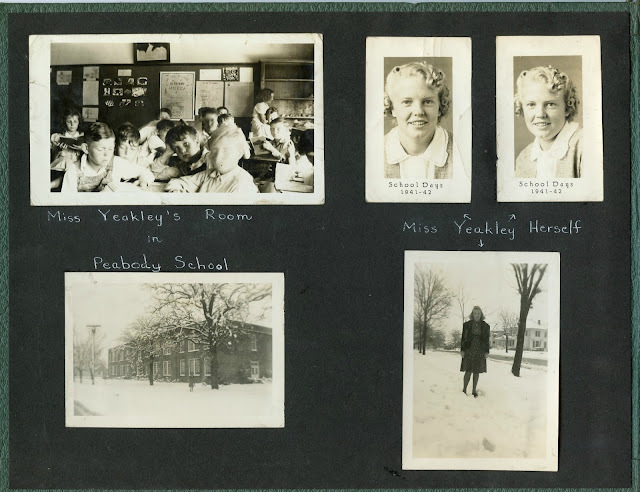 I don't know if she chose Peabody Elementary School but I know that it was something she really enjoyed. The class she taught was the combined 4th and 5th grade class in 1941-1942. She created a scrapbook of the students from that year. 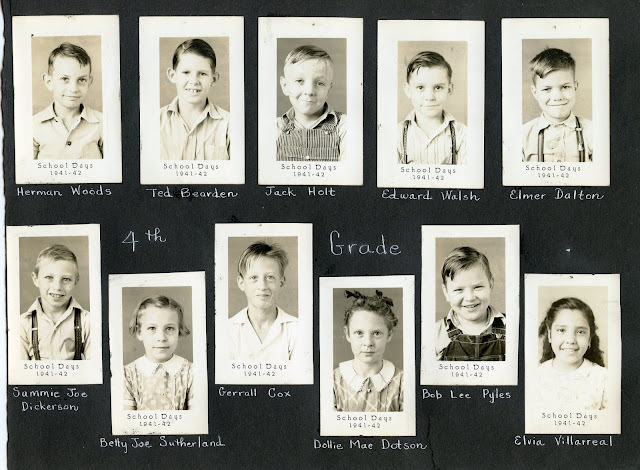 I believe that all pictures should be shared so I am posting the class pictures here. All the kids are identified. Way back in the beginning of my family history research, I ran across the names Mossie and Maude. I thought the names were a little strange but then, my name is Ann Eliese so I guess I shouldn't throw stones. Anyway, the more I researched, the more I found Mossie and Maud in use. For example, this is one picture I used before. 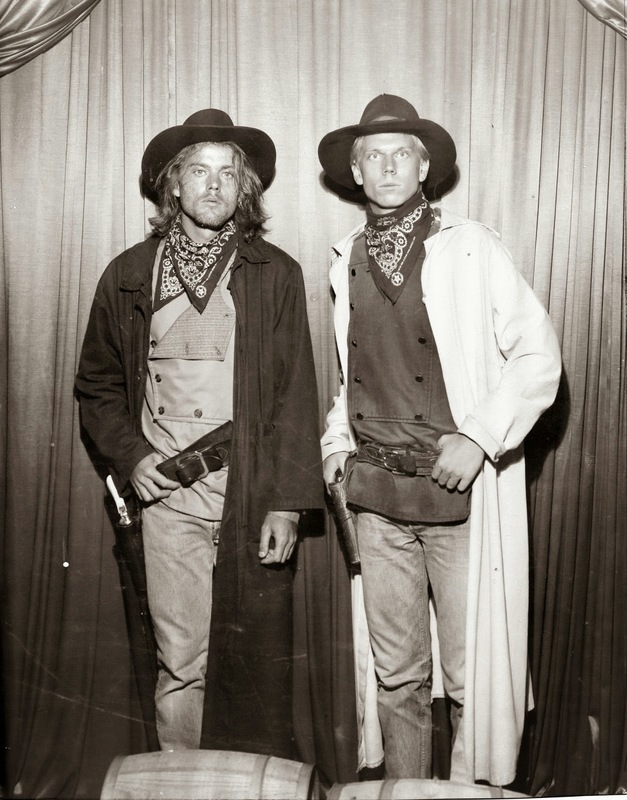 My Great Uncle Victor and my 1st Cousin, 1 time removed, Roy Hatfield. Since I find that confusing, Roy is the son of my grandfather's sister. Anyway, the two girls in the background are Mossie and Maude Cope. 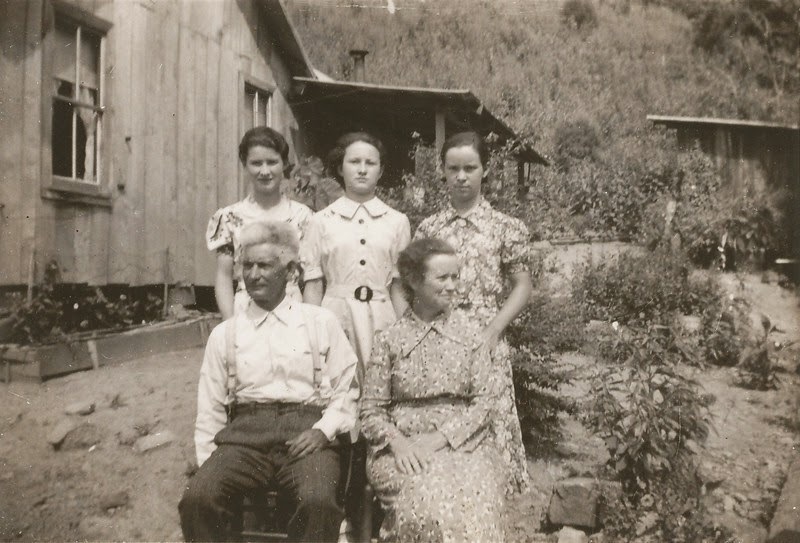 This is where I need to pay attention because the Mossie and Maude in this picture are the daughters of Bobbie Cope, who is the daughter of my grandfather's sister. Then there are these pictures. 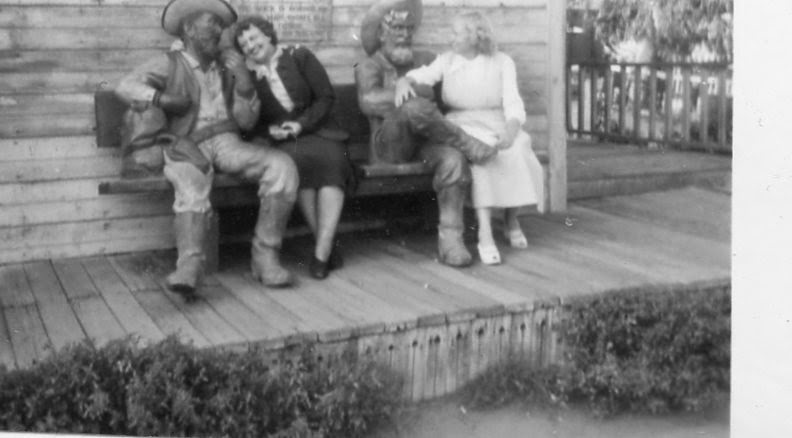 As far as I can tell... this is Mossie Cope, Maud Conard, Roy Hatfield, Maude Cope and Esther Snodgrass. The only one not related is Maud Conard and I'm not really sure of that. 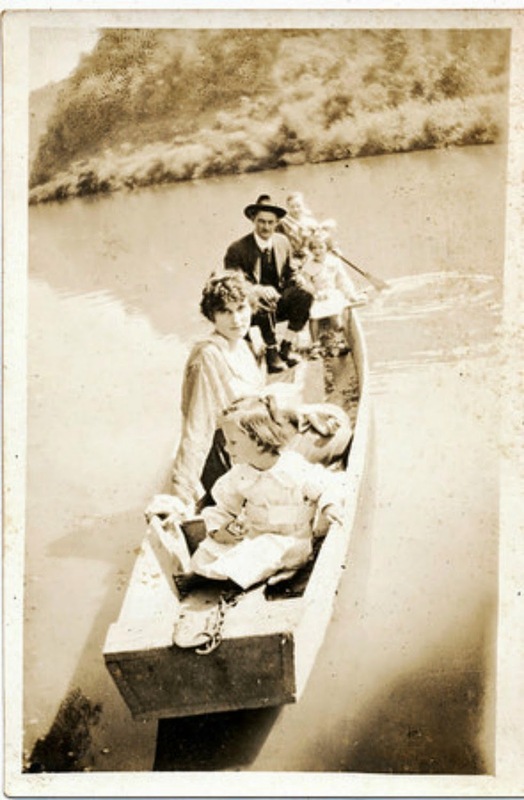 These are the same five people on the "punt". This is the way they crossed the Clinch River. I'm not sure what was on the north side but there are quite a few pictures of this transportation being used by different members of the family. They must have been pretty good at it because all of them appear dry in the photos. So now you see the two Maude's so here's the other Mossie. Victor Rhea, brother to my grandfather, his wife Cornie, mentioned in the "K" post, and their daughters, Mossie, Opal and Jewel. Mossie is the wife of Jack Livesay, mentioned in the "L" post and the mother of Sheldon. It may be typical of many of the older generations to reuse or share names but it is difficult to track when the names are the same. I remember when I was just starting out before I understood that my family was out to make this really difficult. Now that I know their fondness for doing the same name over and over again, I am no longer confused. I think it's because they have become more than names and to me, real people who stories I need to tell. So to the Mossie's and Maude's in my family, I know who you really are! Sheldon Livesay is my 2nd cousin. He is the director of an outreach ministry in Rogersville, Tennesse that feeds not only souls but the bodies of so many in the three surrounding counties. Of One Accord Ministry is actually much more and is doing a great job. 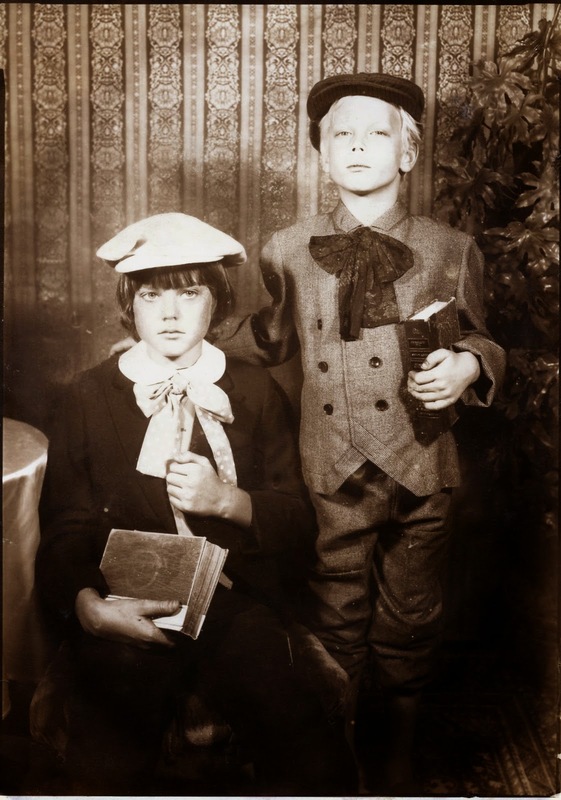 However, Sheldon is also the recipient of a box of photos left in his Aunt Jewelle's basement that lead to even more family history connections. I can't even imagine where we would be without his amazing discovery. Sheldon is the son of Mossie Rhea and Jack Livesay shown below. Mossie is the daughter for Victor Rhea who is the brother of my grandfather. William. 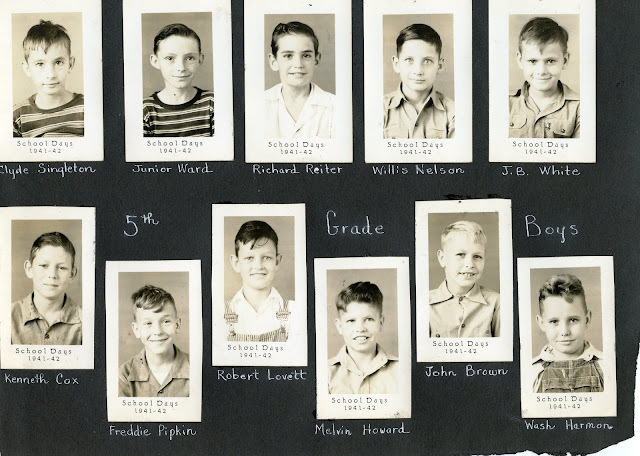 In the picture below, my grandpa is back row, left and Victor is back row, right. I am proud to say that I am related to Sheldon. After visiting Tennessee and seeing his work in person, I realize that he is one of those people who saw a need and took it on. It has made me more giving in my own community. 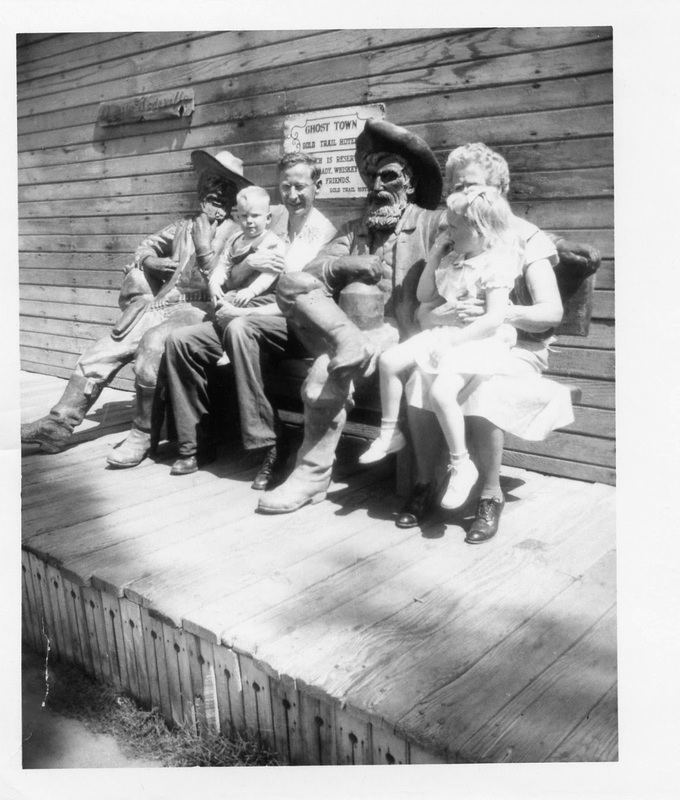 Twice blessed here, Sheldon's ministry has made me a better person and vintage family photos appeared out of thin air to make my genealogy infinitely more interesting. I have a ton of photos from Knott's Berry Farm. Almost all of them are family and they tend to group themselves into themes. For example, my children. and most recently, my husband, my youngest son and my grandson. 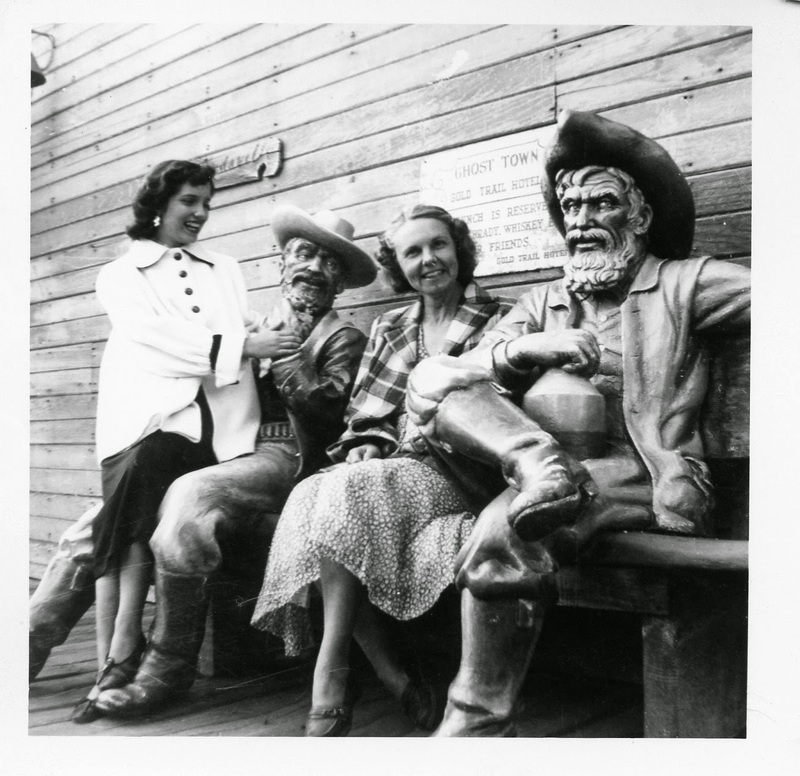 We can go to the famous carved statues of saloon girls and cowboys. Besides being well known, they statues have their own history. If you're interested, you can check it out at Cabazon Dinasaurs. 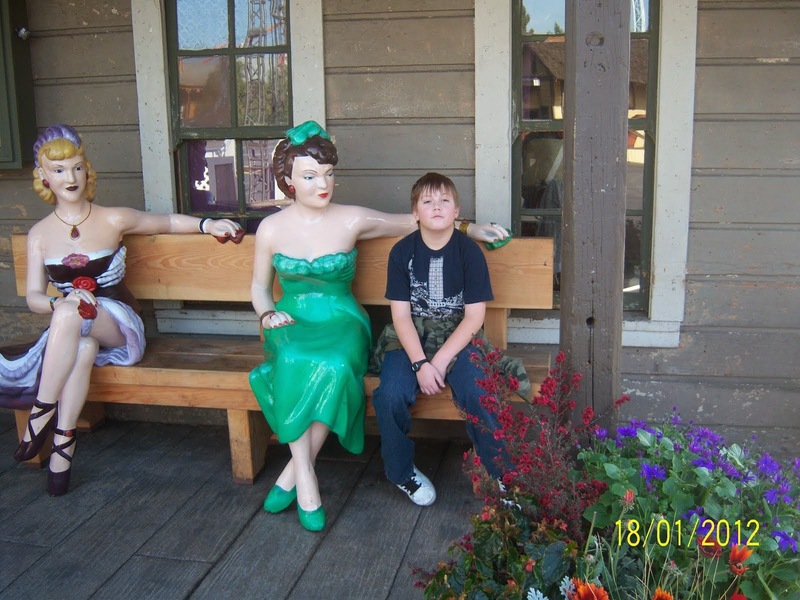 In 2011, at age 11, my grandson had to be forced to sit next to the Saloon girls. He was simply too cool then to be seen with them. 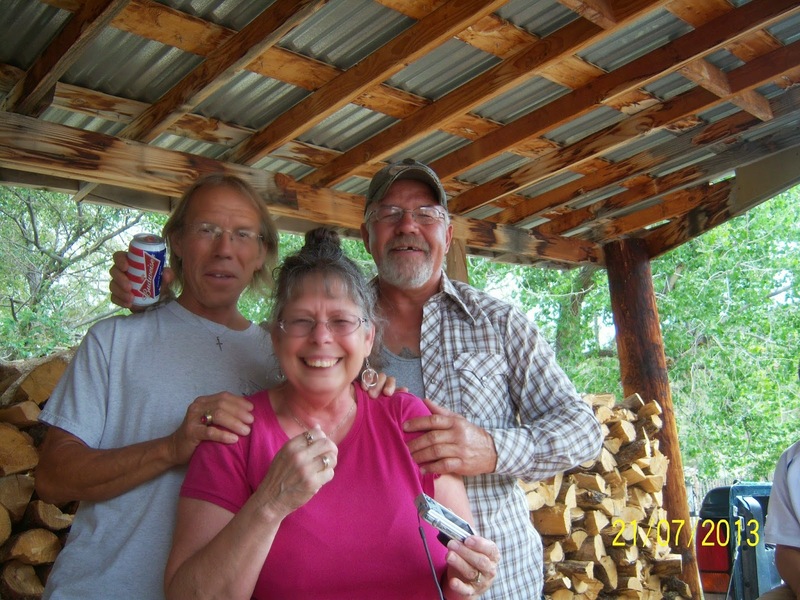 One of my favorite family photos, although my mom, Aunt Anne and Cousin Billy are missing. 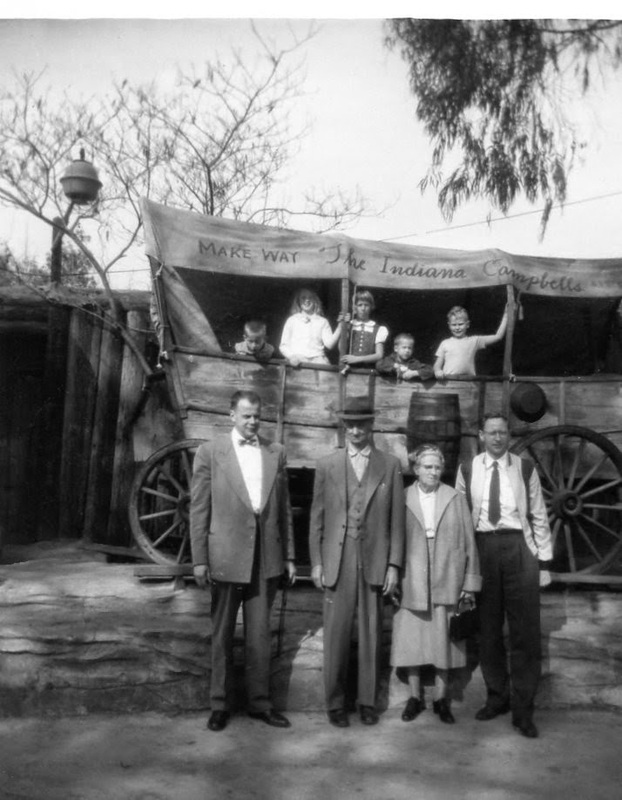 Taken in 1960, it is my Uncle Howard, my Grandpa William, my Grandma Mellie and my Dad in the front and assorted kids in the covered wagon. 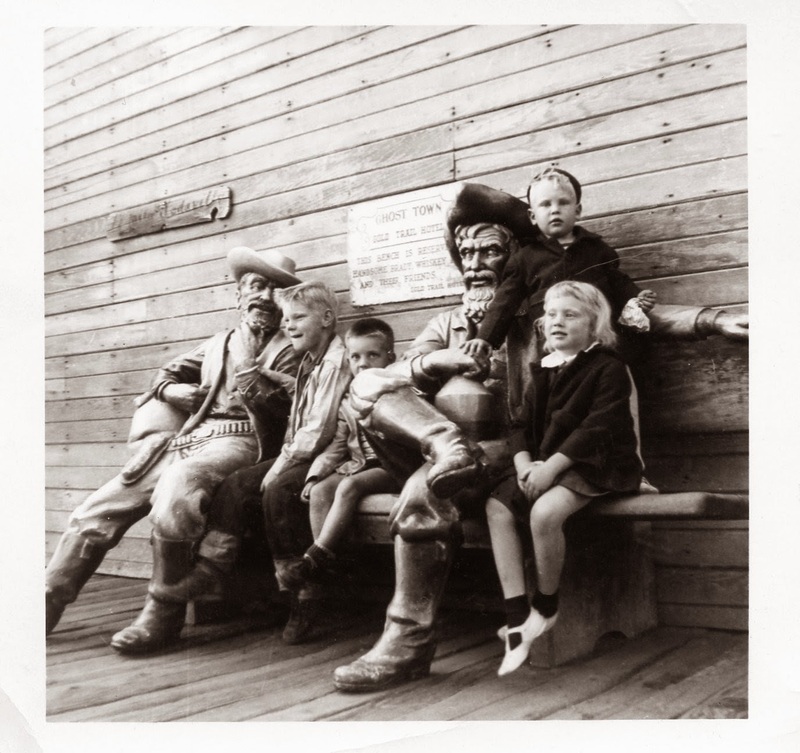 Knott's Berry Farm is still our go to place when family comes to visit. It has changed and has lost a little bit of its charm but it is and always will be home to me. I had the privileged of being contacted by the niece of Mary Mollie Jarvis. She called her "my old aunty!" and went on to tell me more about the family history that I didn't know. 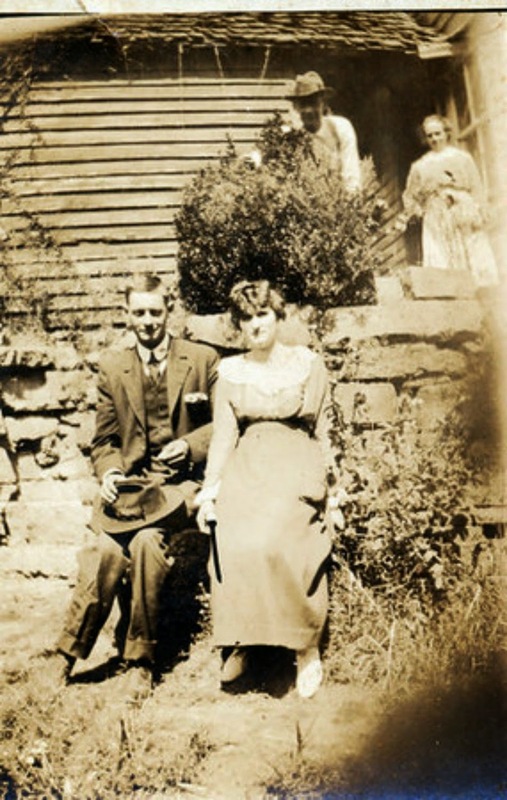 Mary "Mollie" Jarvis married my great grandfather's brother Sterling. Sterling was an interesting character and the local blacksmith. His first wife, Samantha, died when he was 56, leaving several children still at home, the youngest, Lucy, was 9. I guess Sterling thought he needed a wife so he married Molly Jarvis when he was 71 and she was 19. In the 1910 Census, Mollie and Sterling were still doing fine. He still had a daughter at home, not married and 24 years older than his wife. Sterling died in 1915 at the age of 87. Mollie continued on and remarried when she was 37, right after Sterling died. I probably would not have made the connection except my great grandmother writes about it. 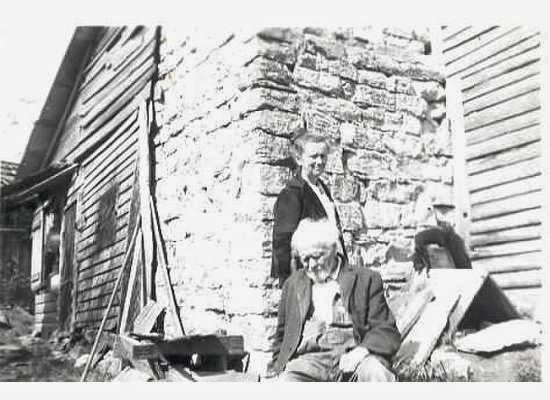 "Your Uncle Sterling's widow married a Quillin and lives on South side of Clinch Mountain. Has 2 children." 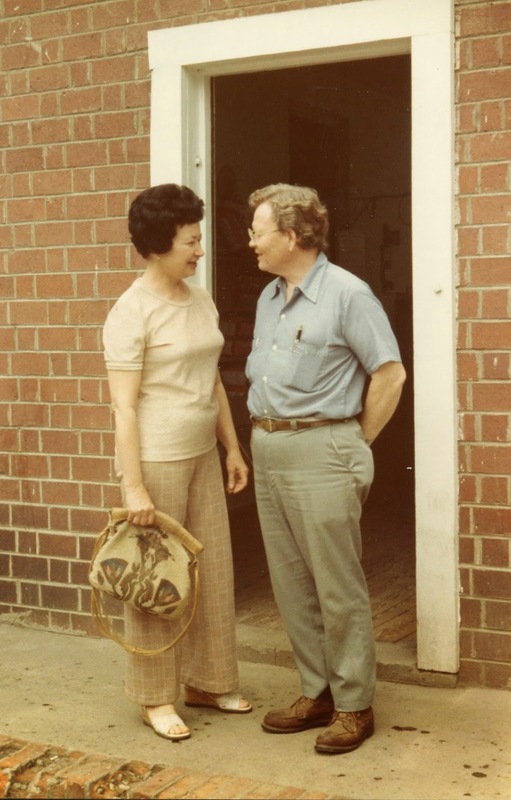 Millie Jarvis and who we believe is John Quillen. We don't know when Mollie passed but we are still looking. In a box in the basement, Sheldon Livesay, my 2nd cousin, found a treasure trove of photos that belonged to his Aunt Jewelle. Jewelle Brown was the daughter of Victor and Cornie Rhea. Sheldon not only scanned all the photos but if they had any kind of writing, he added that also. We have only been able to identify about half of the people and there are several of us working on it. This child is identified as Ira Gardner. My tree does not have anyone by that name and it does not come up in the letters written by my Great Grandmother. However, Jewelle kept it so it was meaningful for her. 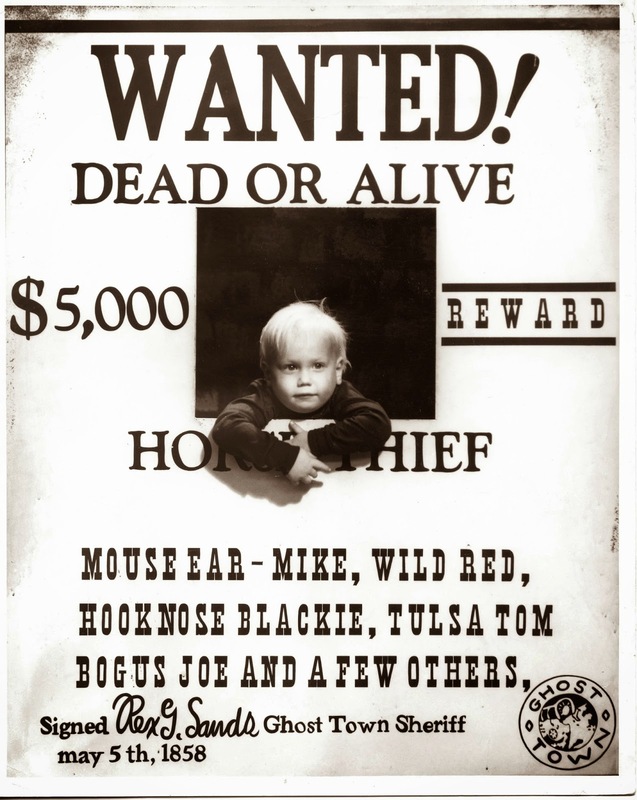 The picture was found in Rogersville, Tennessee. Cute baby, I hope someone will claim him. Much of my understanding of the family history comes from five letters my great grandmother sent to my grandparents in 1918 and 1919. The little snippets in the letters gave me a better understanding of the family and the community they lived in. In one of the letters she talks about King Hutson. "King Hutson paid 3900 for that piece of land after Ans Mathis had bought a strip next to him for 500 dollars, making that piece cost 4400. 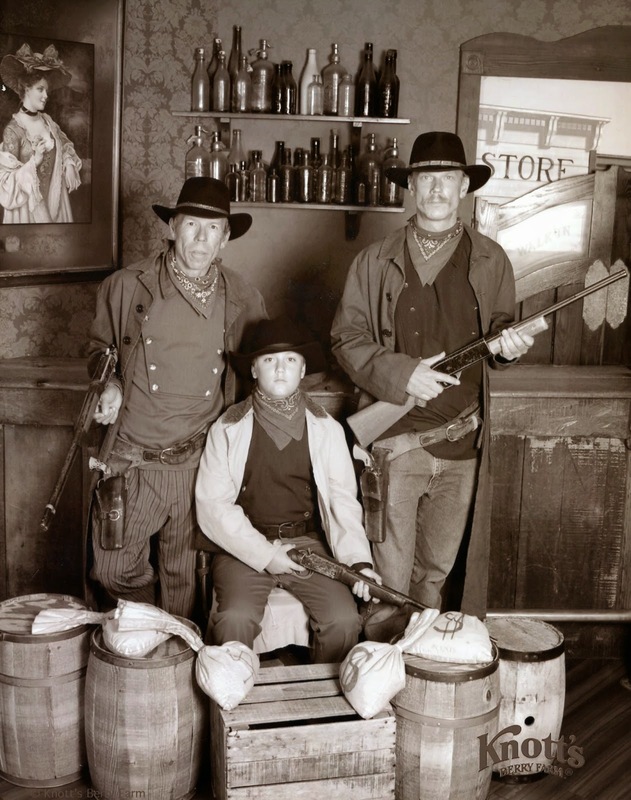 King Huston let Samps, Henry and Levi Hutson have it." Well, that's was about as clear as mud but as I got further into the history, names started popping up. I still can't identify Ans Mathis but the Mathis family does appear on the census so I'll have to make a concentrated effort to track him down. Samps, Henry and Levi are King's children. King Samuel Hutson was the youngest of four children. When I first ran across his name, I was intrigued. Who names their child King Samuel? Then I ran across something else showing he had a sister named Queen Elizabeth. This was before I knew that King was the father of Cornie, who married my great uncle Victor. I thought I had the name Cornie wrong because there are so many misspelling in genealogy but that was her name. I don't know when King died but he is the older man shown in the picture below. 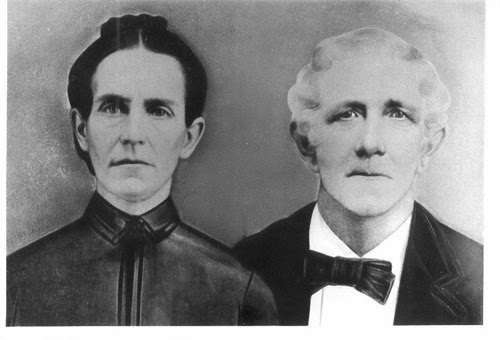 Queen Elizabeth Hutson married George Washington Perry and moved to Indian County in Oklahoma. Queenie died in 1939 at the age of 88. 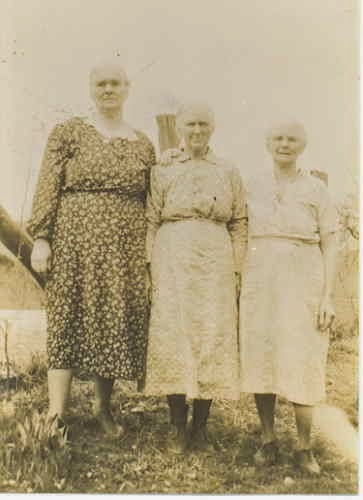 The other two sisters, Amanda and Alice lived well into their 80's and never married. 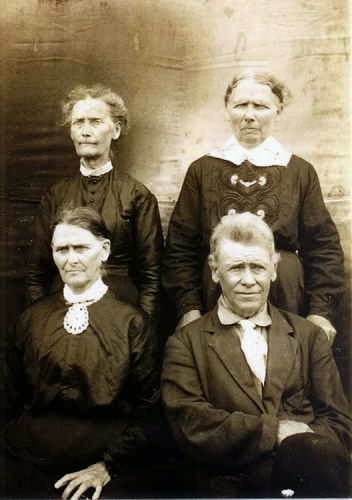 The Hutson family is no longer strange to me but in the beginning of my foray into genealogy, it was a mystery. Today, they are just part of the family although I would like to know more. Fortunately, their great grandchildren are cousins I know well, so maybe it's time to start pushing them for information. Imagine at age 13 you are told that you are not the biological child. Imagine you are told that your "real" mother is Lydia Gaulthair and you father is Ramon Montoya. You look at your parents with a blank stare and ask them to repeat what they just said. That's what my husband did when they told him. Fast forward 30 some years. Gary asks me to see if I can find his missing parents. It's not like we haven't already tried to get information from his mother. She tells him Ramon Montoya was a one-legged Mexican man nicknamed Stumpy, and he took the other two children and fled to Mexico. We know there was another child after Gary who disappeared. We know, in fact, Lydia had 13 children but we don't know where to start looking. We have one picture. It is labeled Francie and Ricky. 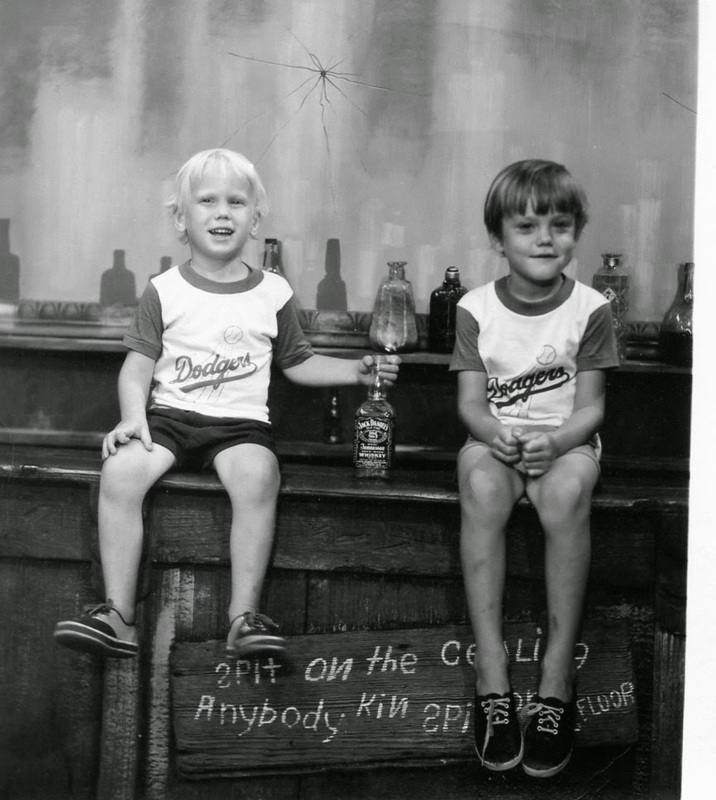 Gary thinks that's wrong because the little boy looks like him. I am good at genealogy and have been working on my family for years so I stop what I'm doing and start on his. We do know that Lydia was the first cousin of his mother. 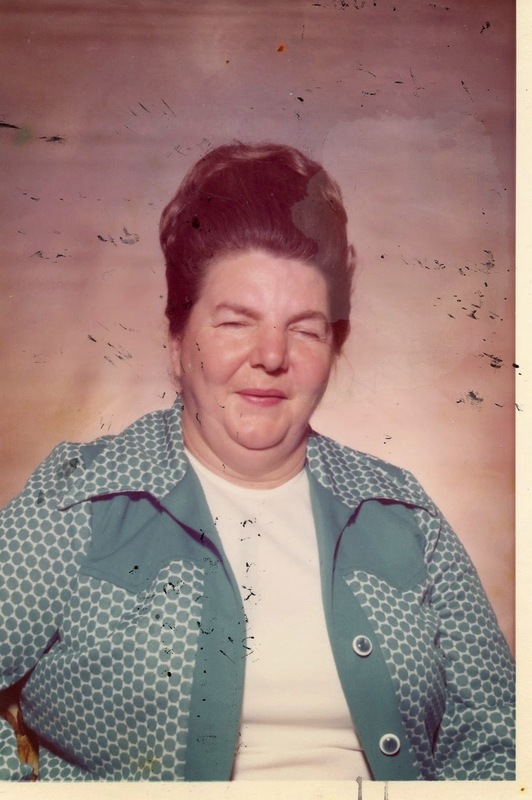 By looking at Ancestry, I find two kids showing their mother as a Lida Gaulthair but have no way to verify it. I find another child who has passed away listing the mother as Lydia Gaulthair. I finally find a death record for Lydia which appears to be the same person. Dead ends everywhere I turn. In desperation, I add another line to my tree listing Gary as a Montoya and the mother as Lydia. Not holding out much hope, who could possible be on Ancestry looking for the same person? Three months later I get a message. It says "PLEASE CONTACT US LYDIA'S CHILDREN NEED INFORMATION ABOUT THEIR MOTHER I'M THEIR COUSIN"
Wow, beyond shocked we have an answer. They don't know it yet but they have contacted their missing brother. The cousin, Esther, is also shocked when I tell her. Ricky and Francie are no longer just a picture. They are very real people. And since this is a really long story, here are the highlights. Ramon Montoya is not Mexican and has never been to Mexico. Stumpy is a nickname for another of Lydia's men and we found two more children with him. No one is missing a leg and everyone involved with Lydia lied. The three original children I found have been verified and except for the one who passed away, all the seven known kids have become family and we talk to them all the time. Lydia gave all of these children away and never looked back. Some went to foster care, one to an orphanage, and some were left with family. We have five kids to go. We think some are Garcia. So I'm posting a picture of Lydia in hopes the remaining siblings can be found. Lida Mae Gaulthair or Lydia Mary Gaulthair, born September 30, 1925, in La Farge, Wisconsin. Died March 18, 2002, in Dallas, Texas. Lived in Wisconsin, California, New Mexico, Arizona, and Texas. First child born in 1941, last known child born in 1960. 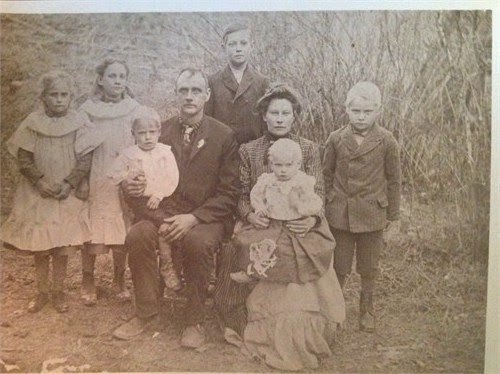 As our family historian, it is my job to track down all the missing ancestors. It's amazing how finding just one leads to another until it is an all consuming task. 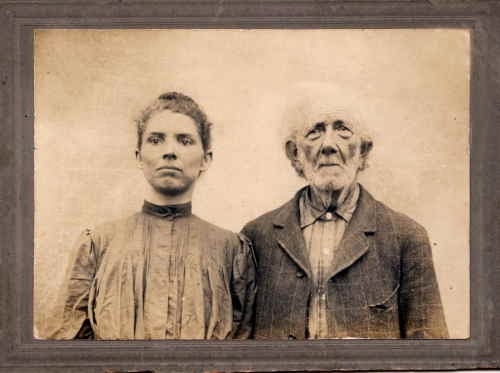 Along the way, the missing ancestors stop being just names and become real people again. You find yourself pulled in by their joys and sorrows. That how it is with my grandpa's sister, Delia. 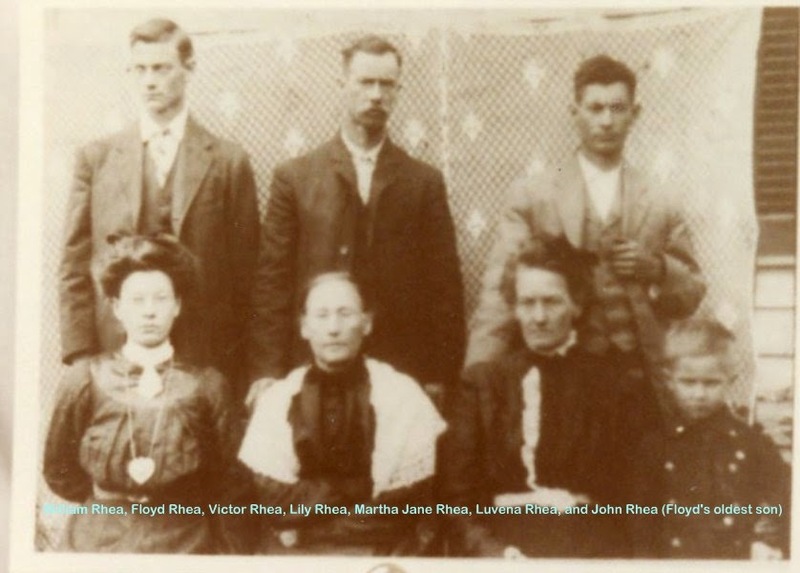 Mack Henry, Delia, Roy, Jessie, Carrie, George, Sidney and John, around 1905. 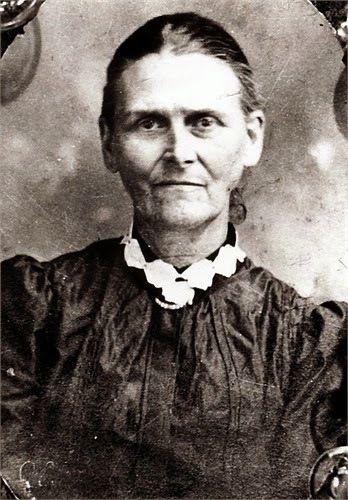 Fidelia Florence Rhea was born on August 11, 1877, in the rural area outside of Sneedville, Tennessee. She was 6th of nine children. She married Mack Henry Hatfield when she was 16. Together they had 10 children, Roy being the oldest. One would expect with that many children, life would be busy and it certainly was for Delia. My great grandmother writes on October 10. 1919, "Delia has a boy they call him Luke Michael". 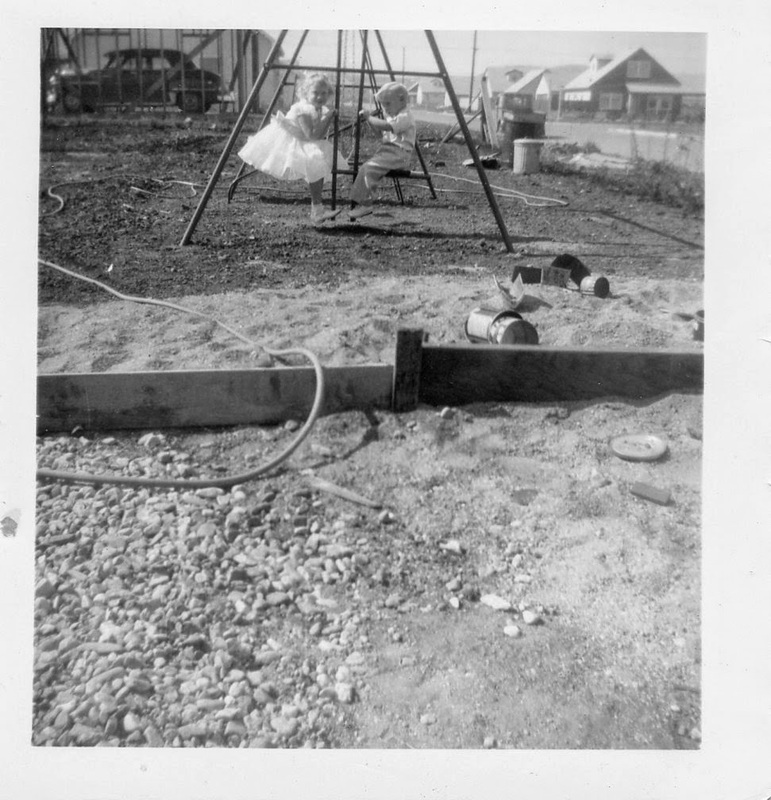 On January 1, 1919, she says, "Roy Hatfield say he is homesick." Roy Hatfield was homesick and ill as well. I don't know anything about soldiers being "gassed" in World War I but he was and never really recovered. He was 25 years old. I suspect these pictures were taken before he was sent overseas. 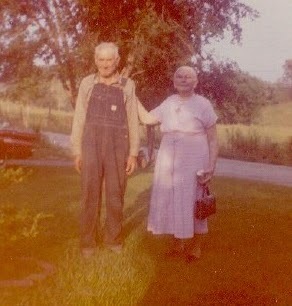 He seemed to be awfully close to Maud Conard but when he came home he married Nola Seals. 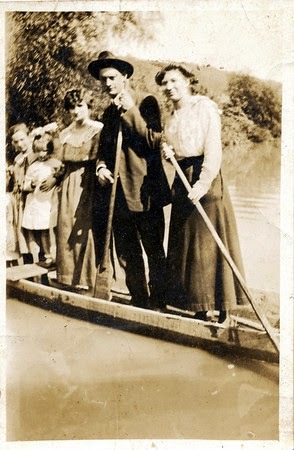 Roy and Maud Conard and various brothers and sisters, crossing the Clinch River. 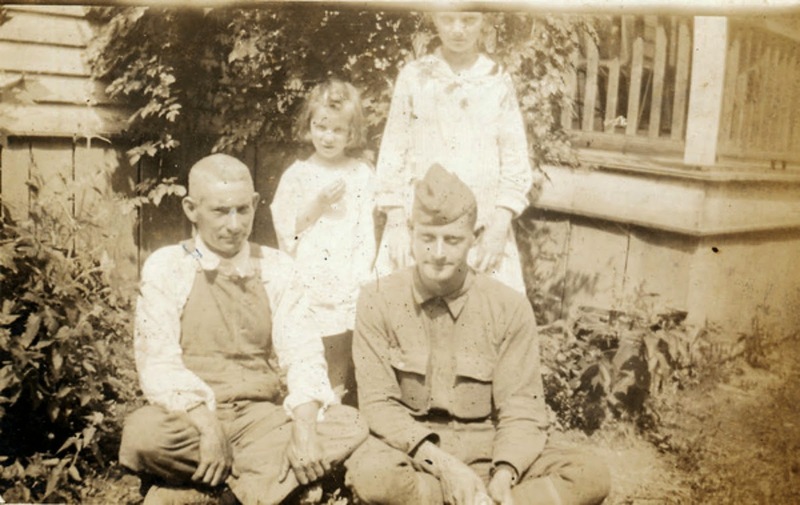 Uncle Victor and Roy Hatfield with Mossie and Maude Cope, friends of the family. I guess Roy Hatfield has been on my mind. Tennessee recently released the death records for the years I am looking for and I found Roy's. We know he was admitted to the National Home for Disabled Soldiers with chronic arthritis in 1928. In 1930, he had moved to the National Soldiers home in Virginia, into the Mental Patients Unit. We don't have a record of his release date but on August 15, 1938, he took the shotgun from the house and went into the forest and shot himself. Jessie, Carrie, John, and Edna lived into their 90's. Sidney committed suicide at 70 in 1972. Grant was in his 70's passing away in 1974. Rhea died of lung cancer at the age of 42 in 1956. 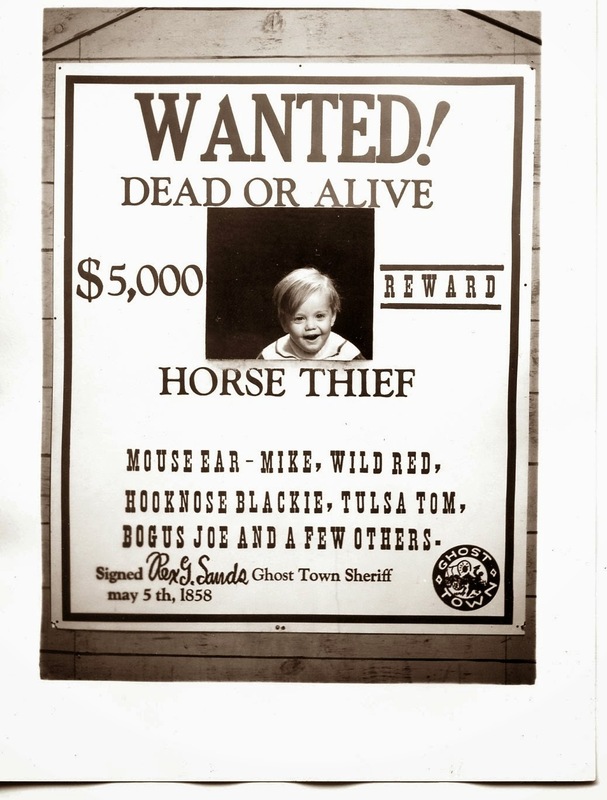 Little Luke died at age 18 in 1937 in a car accident. Delia passed away in 1961 at the age of 83. Mack Henry Hatfield died in 1947 at the age of 81. He also committed suicide so it left Delia to hold the family together. While she was still living, she lost Roy, Rhea, and Luke and her husband. Hats off to Delia. Our family is built on strong women. I grieve for her losses but also take joy in the fact that her great grandchildren talk about her in glowing terms. She survived to share her joy with her grandchildren and great grandchildren and that a glowing testimony to her spirit. A day or two late posting this one. 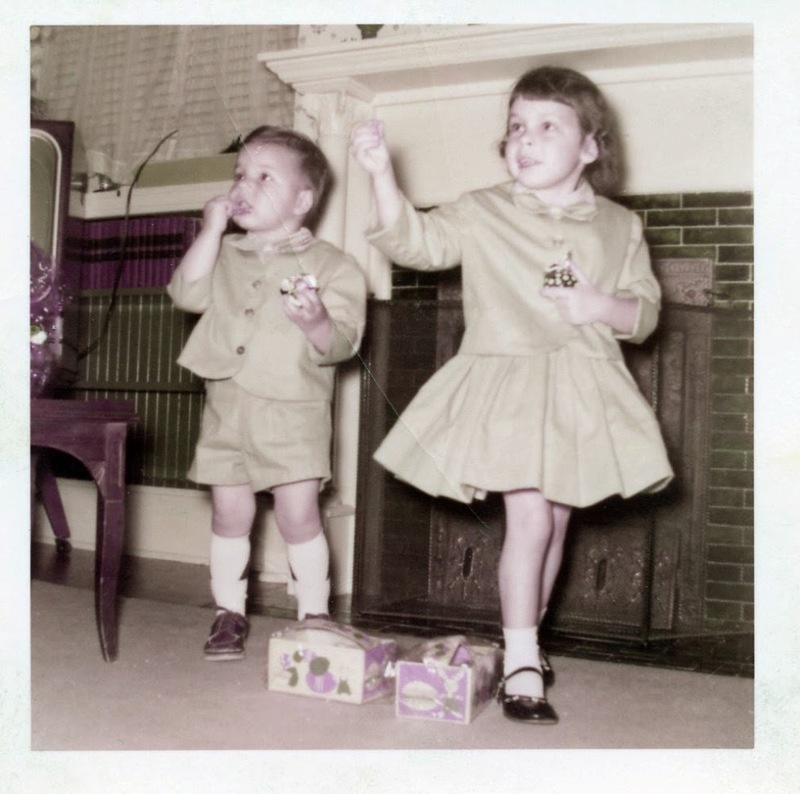 Easter is a family memory as sweet today as it was then. My mom would make my dresses but we always shopped for my Easter Bonnet. Of course, I would get new white shoes. They were shoes I wasn't allowed to play in and only wore them on Sundays. We always had a ham. It is inconceivable to think of Easter without ham. We got Easter baskets and went outside to look for eggs. We always went to church. 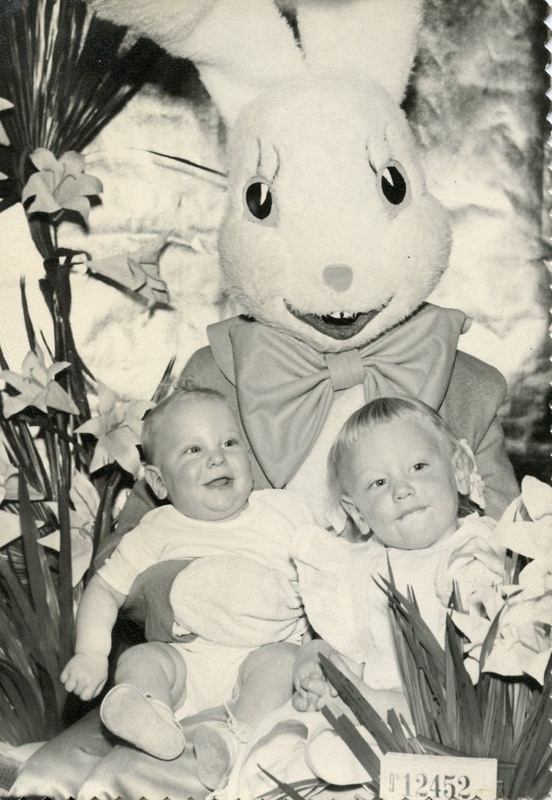 Well, we went to church every Sunday but Easter was special. 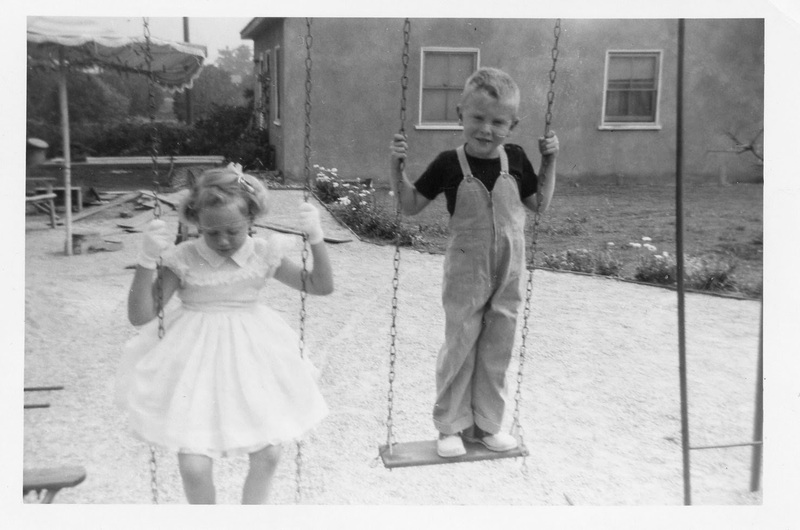 My brother and I in 1954, right after we moved into our brand new house. 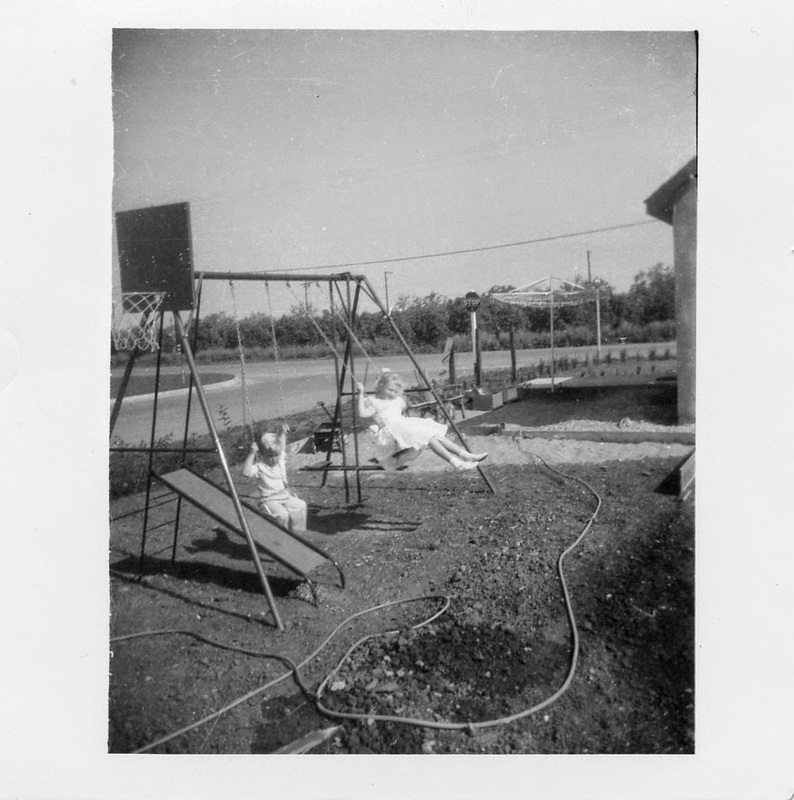 Same swing set in 1955. I am surprised my mom let me swing in gloves although I am thinking this was staged because I don't look so happy. September 1956, not Easter but a regular Sunday morning. 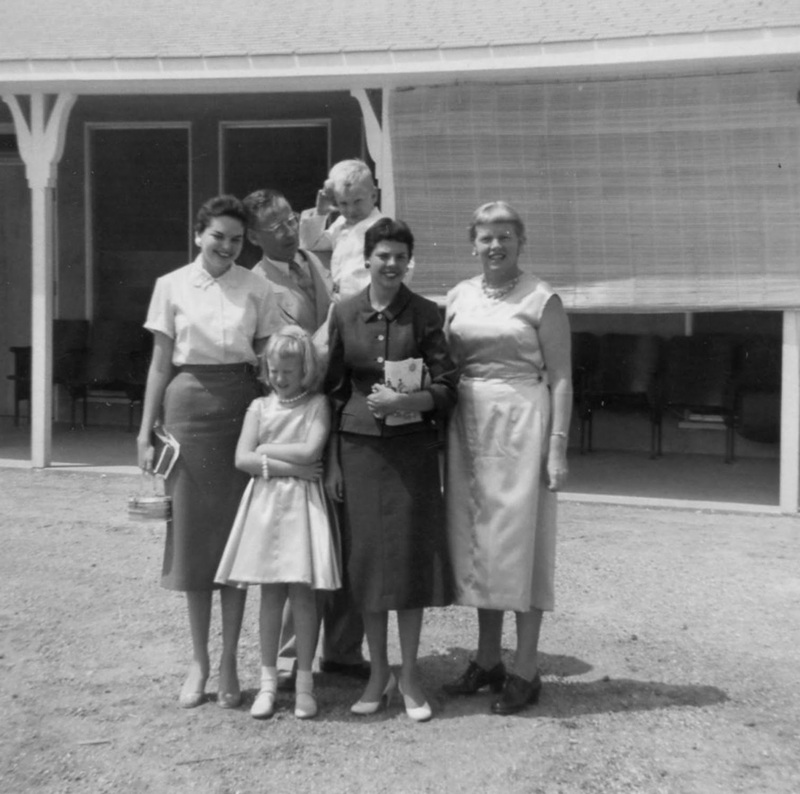 The two younger women are Patsy and Sandra Peach who lived with us, My dad is holding my brother and there's my mom. Again, I am not looking to happy. I didn't like pictures.